...Or that is what some equity pundits masquerading as bond experts want you to believe. They predict that a ‘bondcano’ of rising interest rates will lead to collapsing prices for bonds and bond-like proxies. US fiscal deficit: The late cycle US fiscal stimulus will result in ballooning Government budget, which will be funded from selling more Government bonds. Globalised synchronised growth: The US economy leading the way with robust economic growth and fears of rising inflation around the world. Central Bank quantitative tapering: Central Banks reversing their quantitative easing programs by selling bonds from their bloated balance sheets. 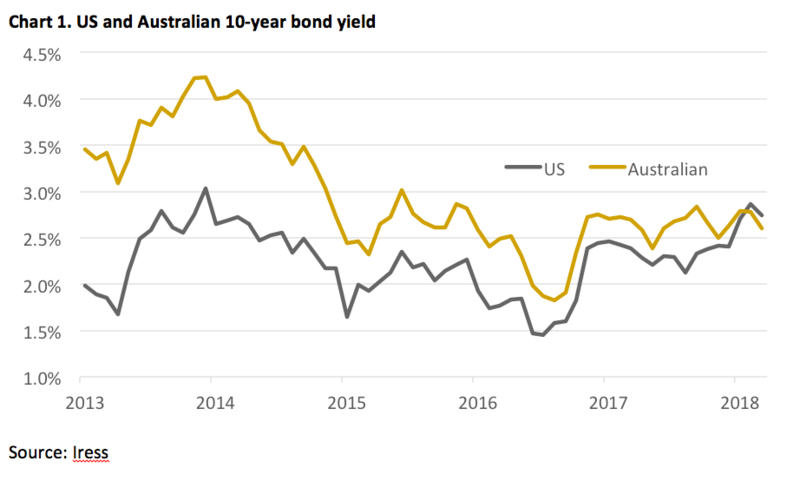 With the backdrop of rising US bond yields, you may be thinking that Australian bond yields should also rise given their historic correlation. Since mid-2017, US bonds indeed experienced a ‘bondcano’ moment. But Australian bond yields have been benign. For the first time in 20-years, the US 10-year bond yield is now higher than the equivalent Australian bond yield. US 10-year rates have mean reverted to 2014 levels, while Australian rates are well below the peak in early 2014. Why are Australian interest rates out of sync with the US? Specifically, household and government debt. Interest rates are highly linked to GDP growth. However, they are bounded – the lower limit is close to zero and the upper limit is a function of the indebtedness of an economy. The more debt an economy holds the closer it approaches a ‘Minsky moment’ of economic collapse when interest rates rise. Given that household consumption represents about 60-70% of total GDP for developed economies, household debt matters. Prior to the global financial crisis (GFC) the trend of household debt to GDP was correlated for both US and Australia. However, post-GFC the debt paths have differed. The US went through a tumultuous period of purging some of their household debt. On the other hand, Australia’s household debt to GDP continued to soar. High debt levels are a problem when interest rates rise because debt serviceability (debt payments to income ratio) will eventually become unsustainable. This was recently highlighted by the Bank of International Settlements when they analysed the debt serviceability of various countries under different interest rate scenarios. Deleveraged countries (like the US) can withstand higher interest rates, hence the impact on household consumption will be lower. On the other hand, indebted countries (like Australia) cannot tolerate higher interest rates otherwise household consumption may collapse. To be clear, we are not saying bond yields cannot rise in Australia. Currently, the Australian 10-year bond yield is 2.6% and it could mean revert to early 2014 levels of 4%. But if it does our economy will increasingly become fragile because Australian household debt is about 20% higher than four years ago. Over the same period, average weekly earnings have only increased by about 7%. Wages need to significantly catch up to de-risk Australia’s large household debt. With a greater debt load in Australia it now takes a much smaller increase in interest rates to slow economic growth. Several studies including the IMF Global Financial Stability Report (October 2017) highlight that while increased debt supports higher economic growth in the short term it eventually hampers growth in the medium term. If the studies are correct, given that Australian household debt peaked in 2016, lower household consumption should drag on real economic activity in the coming years and also on interest rates. However, astute readers may point out that nominal bond yields can still rise if inflationary expectations rise. In this regard, economists categorise inflation into tradable inflation (price of goods and services from international trade) and domestic inflation (price of domestic goods and services). Australian tradable inflation is heavily influenced by commodity prices and the Australian currency, which in turn is significantly influenced by China. We made our views clear about China. But we’ll let you decide on whether China is in an expansionary or contractionary phase. Domestic inflation is mostly anchored to wage growth. It requires the combination of strong economic activity and full employment for wage growth to become noticeable (which is typically represented by the Phillips curve). 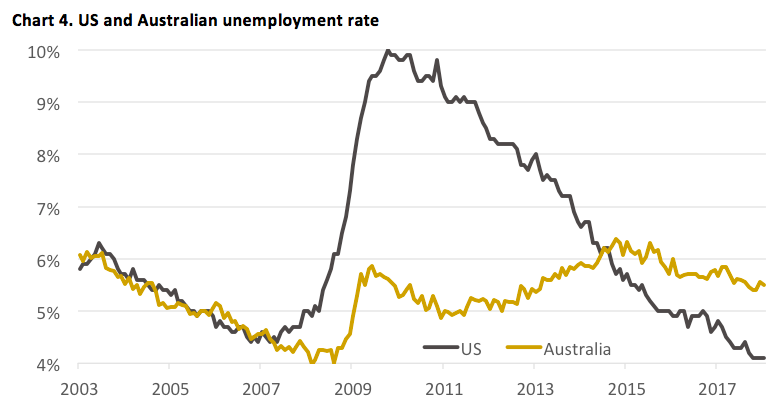 To highlight how much labour slack is in the economy the chart below shows the unemployment rate for US and Australia. Prior to the GFC, like the household debt chart, the trend in unemployment was very similar for both countries. However, post GFC, the differences are stark. The US unemployment rate is now below its pre-GFC lows. On the other hand, Australia’s unemployment rate is still elevated and is closer to its 2014 peak than its pre-GFC low. With a tight US labour market, there is little doubt that wage pressure will underpin US inflation expectations. However, US wage inflation has no bearing on Australian wage inflation because their labour market conditions are very different. If Australia’s interest rates remain benign from sluggish economic growth (due to indebted households) and subdued inflation (due to labour slack), why is there so much fear? Some commentators point to the famous ‘banana republic’ quote by treasurer Paul Keating in 1986. Global bond vigilantes demand higher interest rates when public finances are in disarray. 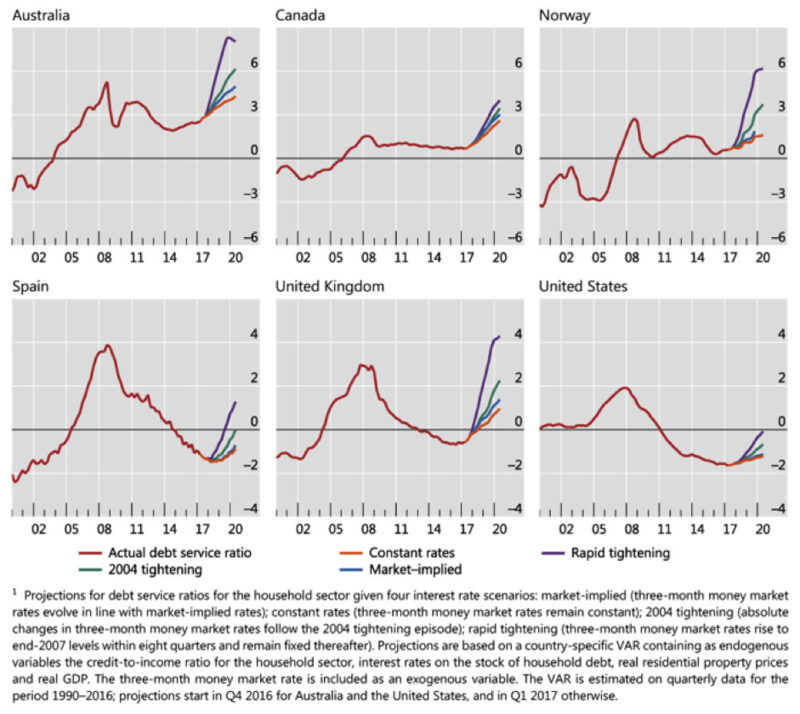 Contrary to popular belief Australia’s government indebtedness compared to the rest of the world looks great. On the other hand, the US government is one of the most indebted countries in the world. 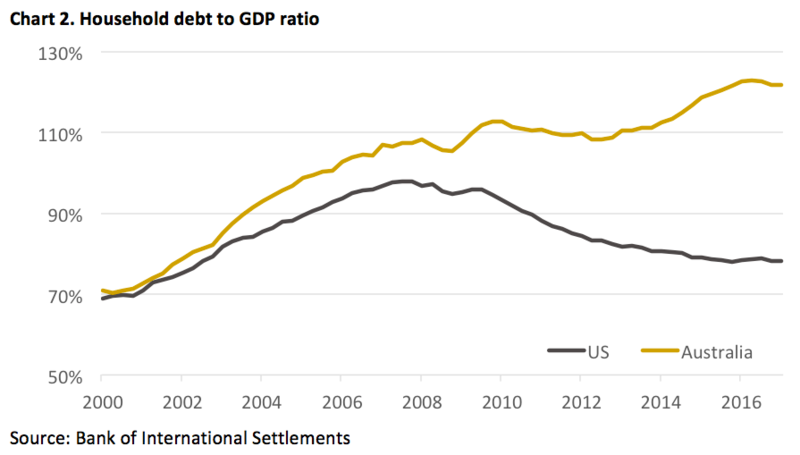 The level of US debt is flying high with the PIGS (Portugal, Italy, Greece and Spain – countries that suffered a sovereign debt crisis during the GFC). And it will get worse for the US. The tax cuts and the late cycle fiscal program is estimated to blow out the US government debt to GDP to more than 130% by 2025. Global bond holders may now be demanding higher interest rates to reflect higher sovereign default risk. Currently, the US may be experiencing a ‘banana republic’ moment where the demand for US currency is weak even though US interest rates are rising relative to the rest of the world. In contrast, a healthier Australian government balance sheet has attracted strong global demand for Australian bonds, hence keeping our interest rates lower. In summary, while Australian and US interest rates have historically been correlated their paths can differ. Given that Australia’s debt situation and economic environment are currently very different to the US our interest rate path will likely be very different. A US ‘bondcano’ moment is simply not translating to Australia. there is another side to this household debt issue? Pensioners and retirees have been getting lousy returns for nearly 10 years on their deposits,and they have had to surely adjust their living standards too! Financial institutions generally have also massaged rates down regularly without any reference to the Reserve Bank (which is toothless anyway) by very small increments to stay unnoticed. There is no ethics anymore just profit greed everywhere(the Banking enquiry). No wonder people are disillusioned with governments and big business.